….Lorna Moorhead and Mark Reed threw a Renaissance-themed holiday dinner party Dec. 5 at Ione's Howard Park as a fund-raiser for MS MOMS - a Web-based community benefiting patients with multiple sclerosis. 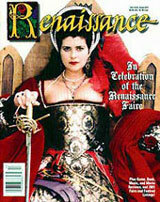 The private "It's a Renaissance Christmas" bash was a thank-you gift from the two festival promoters to their friends in the Renaissance Faire community for all their support over the years. Moorhead has written two books on the subject: "Coffee in the Cereal - the First Year with Multiple Sclerosis," and "Phone in the Fridge - Five Years with Multiple Sclerosis." The books detail her experience dealing with MS while raising four children, who are now 14, 5, 4 and 3. "I wanted to write a book that didn't make you want to slit your wrist," Moorhead said. "Our motto is 'learn, laugh, live.' If you're going to have to go home and live with it, you might as well live with laughter." "It's a Renaissance Christmas" served more than 40 people, who were members of MS MOMS as well as various vendors and performance troupes who are part of the Northern California Renaissance Faire scene. "The Ren Faire community has been very supportive of us over the years," Reed said. "It's been a hard financial year and they gave us so much." Throughout the past 10 years, Ren Faire vendors have donated items for MS MOMS to give away at raffles. Performance troupes, minstrels, vendors and others involved in the community have donated time and money to the cause as well. Reed has been involved in the festival circuit for 18 years. When he wasn't managing a festival, he was selling swords at fairs through his company, The Rusty Sword Company. He said he usually attends 20 festivals a year, three or four of which he manages…. The dinner gala provided an opportunity for this tightly knit cohort to sit down together and share a meal among friends without the stress of business interfering with their fun. "We've known these people for years but we never get to spend any time together," he said. "We're usually so busy working behind our booths," said Michael Proctor, chief financial officer for MS MOMS and an active participant åin the various Renaissance Faires in the region. …begins on February 9th and runs until the end of March. It is held on weekends only (and President’s Day). It boasts twelve stages of continuous entertainment, jousting tournaments, an outdoor circus and day-long feasting! Grab your cloak and get over there! The 30 acre Festival Village can be found on Highway 60 (Superstition Freeway) past Kings Ranch Road. This is between Apache Junction and Florence Junction. Medieval banquets, King Henry and over 200 ’shoppes’ await your visit. So, if you want to talk like you belong at the Renaissance Faire, you could say, “Thine eyes are lovely,” to an attractive wench, or “Thou art a strapping lad,” to a muscular pickle vendor. When you first arrive at the Renaissance Faire, you will most likely be greeted by a troup of costumed actors shouting out ‘Good morrow’ and ‘Good day.’ If you arrive in the evening, that phrase would be changed to ‘Good Even.’ When you leave the fair, you will hear ‘Fair thee well’ or, if it is still early, ‘Tarry a while’ which tells you to stay for a longer time. Renaissance Faire Talk - What to Do With Verbs?